The G. Scott & Bessie K. Guyer Foundation was created to benefit the communities located within a 10 mile radius of Shamokin Dam, Snyder County, Pennsylvania. Special consideration is given to local organizations focused on improving the lives of those in need and providing service to the community. 1. Program development and special projects. 2. Equipment that brings new capabilities to an organization. 1. Proposals for annual campaigns, general endowment funds, and operating budgets. 2. Requests from individuals for any purpose including loans, scholarships, or emergency needs. 4. Promotion of religious or political activities. The G. Scott & Bessie K. Guyer Foundation makes grants to charitable organizations that are exempt under the Internal Revenue Code or to municipal agencies. 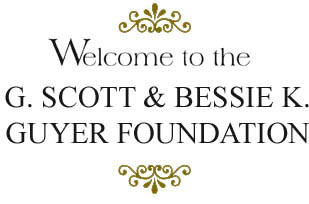 The G. Scott & Bessie K. Guyer Foundation does reserve the right to initiate projects and to fund organizations that are of particular interest to the foundation. Visits by applicants to the G. Scott & Bessie K. Guyer Foundation are discouraged. Typically a Two-Stage application process will occur. Depending upon the size of the grant or the frequency in which grants may have been given in the past to an applicant, funding may be authorized after completion of the first step. Included in this website is an application form that must be submitted with all requests for funding (See link at bottom of page). For the convenience of applicants the two page application form can be printed, and photocopied (BUT MUST REMAIN A TWO PAGE APPLICATION WITH ONE STAPLE IN UPPER LEFT CORNER). DO NOT USE NOTEBOOKS, FOLDERS, OR BIND PAGES TOGETHER. No additional back-up materials, videos, or cassettes are to be sent because they will not be reviewed and cannot be returned. All information submitted to the G. Scott & Bessie K. Guyer Foundation shall be on recyclable paper and stapled with ease of recycling in mind. The G. Scott & Bessie K. Guyer Foundation favors conservation of the earths' resources so application information will be stored for a limited period and then recycled. No applications are to be submitted by fax or e-mail. 1. One-page cover letter signed by the executive director or person in charge of the organization or project. The cover letter should indicate whether funding is being requested as a multi-year award. Funding can be sought for one or up to five years. 1. Most recent annual report and financial statement. 2. Copy of IRS letter verifying nonprofit charitable status. Do not send any document from Department of Revenue for Pennsylvania. A sales tax exempt notice or state corporation certificate is insufficient. 3. Separate one-page, line item budget identifying the projected income and expense of the organization and the program. 1. An explanation of the program to be funded including timeframes, objectives and goals. 2. Organizational overview including mission statement, history and services provided. 3. Current list of officers, directors and trustees. 4. Complete budget of the project, including amount of grant money being requested, plus detailed description of other sources of support. Also a second budget indicating how the project could be accomplished without funding from the G. Scott & Bessie K. Guyer Foundation. 5. Statement projecting funding sources for future years to assure completion of project if timetable calls for multiple years. 6. Statement defining assessment and evaluation plans to measure the success of the project. 7. Your organization may be visited for inspection and interviews. 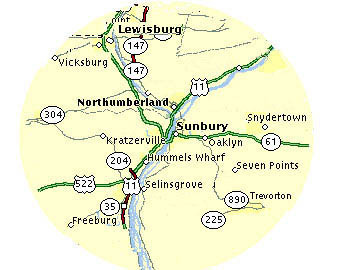 To be eligible for funding the applicant must be located within a (10) mile radius of Shamokin Dam, Snyder County, Pennsylvania. Please look at the geographic region defined by the map below. Grants range from $500.00 to $3,000.00, but smaller and larger grants are given. Rarely are grants given to pay all costs of a project. Broad-based community support through contributions from local citizenry and volunteerism is viewed favorably. The applicant should state if multiple-year payments of the grant will be acceptable.